but sometimes I play one in real life. A couple of years ago our dog, Cricket, had a sore on her cheek that she refused to leave alone long enough for it to heal. The Girls and I decided the solution to this problem was a "cone of shame". So we purchased a plastic flower pot basket and made her one. It worked great. A week later the sore was completely healed so we removed the "cone of shame" and allowed her to begin putting the traumatic experience behind her. A couple of months ago our cat, Smudge AKA The Hero, got a tick bite on his neck. Unfortunately, what started out as a small tick bite quickly became a large sore when he refused to leave it alone. I tried putting anti-itch cream on it but it didn't seem to help. We tried making him leave it alone but he would just sneak off and scratch it anyway. So finally I decided that desperate times called for desperate measures. 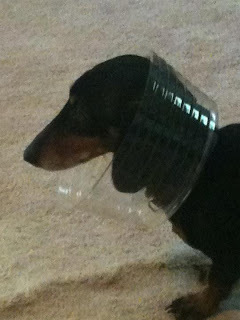 Since I couldn't put him in a "cone of shame" I had to come up with something else. I grabbed one of L's old tube socks and some duct tape and created him what I'm certain he considered to be the "hat of humiliation". The are no words to describe how excited (yea, that's the word I'm going with) he was when I put that hat on. Can't you just see the happy radiating off of him?!?! Can you see it? I was only able to find camouflage duct tape at the house, but I assured him that was a good thing since it would practically blend in. Right? Right? I'm happy to report the sore completely healed without any complications, and Smudge can almost look us in the eye again.